The internet is full of ironies. I, for one, could never have guessed that writing about the end of books would generate more income for me than actually publishing the damn things. I’ve been on an End of Books reading tour since August and it turns out that what the internet gurus say about consumers being more willing to pay for events, speeches and gigs, rather than buying cultural objects, is now becoming true. At the other end of the political spectrum from me, among the epublishing enthusiasts and digital fundamentalists, similar ironies are playing out: there is now a boom industry in “How to get rich writing e-books” manuals, as well as a multitude of blogs offering tips and services, and a new breed of specialists who’ll charge you anything from $37 to $149 to get your e-book into shape. This all seems like a repeat of the boom in get-rich-quick manuals and “specialists” that appeared around blogs and e-trading. Did anyone actually get rich from writing blogs, you may ask? Well, according to Jaron Lanier (author of You are not a Gadget) there are only a handful of people in the world who can prove that they make a living from blogging: it’s entirely possible that more money was made by those who wrote and sold the how-to manuals than by the bloggers themselves. But who cares, right? It’s all part of the euphoria of digital change, and technological innovation is as unstoppable a force as fate. Reports show that paper book sales are “tanking” – down a massive 54.3% while e-book sales are up triumphantly by 138%. The revolution will be e-published, and we’re all going to be part of it. But all of this gives me an alarming sense of deja vu. There’s another name for what happens when people start to make money out of speculation and hype: it’s called a bubble. Like the dotcom bubble, the commercial real estate bubble, the subprime mortgage bubble, the credit bubble and the derivative trading bubble before it, the DIY epublishing bubble is inflating around us. Each of those other bubbles also saw, in their earliest stages, a great deal of fuss made over a “new” phenomenon, which was then over-hyped and over-leveraged. But speculation, as we’ve learned at our peril, is a very dangerous foundation for any business. And when the e-pub bubble bursts, as all previous bubbles have done, the fall-out for publishing and writing may be even harder to repair than it is proving to be in the fields of mortgages, derivatives and personal debt. Because this bubble is based on cultural, not purely economic, grounds. 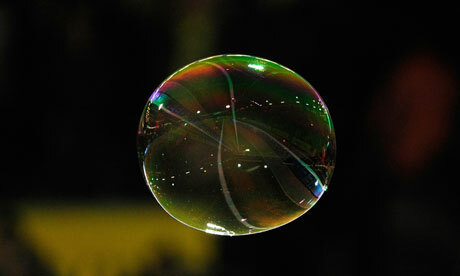 How do we know if we’re in a bubble? This has certainly occurred with epublishing. Over the last decade, Amazon has undercut the big global publishing houses through a radical new structural approach to storage and distribution and grown so quickly that it forced them to renegotiate their pricing policies. Then in opening up the long tail market and making hundreds of thousands of lost titles available again for resale, it reinvented bookselling. The creation of Kindle led to a new generation of e-readers which, with Apple, launched an economic boom in a previously non-existent market. It has already become a cliché in all media that digital self-publishing is a revolution comparable to the invention of the printing press. That is a lot of disturbance in a short space of time. On first inspection, e-publishing doesn’t appear to fit the model here, as it’s clear that the prices of ebooks are falling drastically (in the week of Jan 1, 28% of the top 100 e-books on Amazon were 99p or under, and 48% were under £2.99). But that’s because we’re looking at this the wrong way round – from the perspective of the consumer. The e-book explosion is coupled with the rise of the e-reader, and the profits there are in the hands of the manufacturers. There has also been a fast turn around in these new technologies from Kindle to Kindle Fire, from iPad to iPad 2; and a brand new market of consumers for these products has appeared from nowhere. The change to cheap ebooks and self-published ebooks is a “change in underlying fundamentals”. 1. Increasing prices/sales do not, by themselves, create a bubble. Every financial bubble needs fuel; cheap and easy credit is that fuel. Without it, there can be no speculation and the sector returns to a normal state. Speculation takes over and there is a rush to “get in” as newcomers become involved “cheaply” 2. When a bubble starts, the sector involved pushes stories into the media, and is suddenly inundated by outsiders; people who normally would not be there. 1. “Easy credit” in this case relates to the plummeting costs of digital content. In fact, there is an inverse correlation between the cheapness of digital content and the high cost of e-readers and smart technology. The more ‘free’ or nearly-free content is available online, the more appealing expensive e-reader and iPad technologies have become. Furthermore, “cheaply” here refers to the ease with which someone can now self publish. A decade ago, self publishing could costs thousands of pounds for a mere 100-book print run. Now it is free or almost free. 2. The whole point of self-epublishing is that the market “brings in people who would not normally be there”. Like the promise that we can all have an affordable home with a cheap mortgage, we are being told constantly by digital businesses and the media that we can all be writers and even be successful as writers. Even the tabloids are generating hype, telling the masses that they each can make millions through self-epublishing. The more traffic there is in self-epublishing the more the hype has ‘evidence’ to support it. According to USA today, “it’s a gold rush…get out there”. 2. Over the last six months there has been a huge growth in the number of people with no former experience who have entered self-epublishing. Taking myself as a representative slice of the public, I can attest, from recent personal experience, to the following: People I know who have been rejected by mainstream publishers have brought out their first ebooks on Kindle; people I didn’t even know had novels under their beds have done the same; friends of friends on Facebook have announced that they too have novels and short stories available on Kindle, Nook, Kobo, iPad and Sony Reader. Locally, I have seen two new digital publishing houses born from nothing and paying no advances, operating on “spec” writing. And all of these people are self-promoting their work on what platforms they have: Twitter, Facebook and their blogs. All of this is evidence of a “desperation to enter the market”. I know this because I also felt the pressure to try it (and did: I self re-epublished what was my first book). People who are self-epublishing for the first time are also buying their first iPads and Kindles, so as to better understand the e-pub technologies and to further promote their ebooks. They may be giving their ebooks away for free but they’re spending between £100-400 on single items of new technology – more than they ever actually spent on books in a year. The model of e-book success that’s held up for everyone to copy is based on half-truths. Even those who are seen as e-book stars are actually transitional figures straddling the digital self-publishing and the mainstream camps. Take for example digital guru, free culture activist (former European director of the Electronic Frontier Foundation) and author Cory Doctorow – an SF celebrity and aggressive exponent of self-epublishing who gives his books away for free under a creative commons license (with optional payment). It turns out that Doctorow isn’t just any old novelist: the subjects he and his characters talk about are file sharing, the digital revolution, digital rights management and the oppressive old gatekeepers of the mainstream. His kudos comes from the fact that we are in a transitional period in which “free digital culture” is still an issue. Ironically, if and when self-epublishing becomes the norm, his subject matter will no longer seem so radical and no doubt his reader base will diminish. Or take Amanda Hocking, the paradigmatic example of epublishing success, who has made $2.5m from selling her own ebook. Hocking writes about the supernatural and teenagers, and her success is due in no small part to what the industry calls “piggybacking” on a mainstream success. Without Twilight, and the popularisation of the teen-romantic-horror genre, it is doubtful that Hocking would have a foothold in the industry, or that many people beyond her internet friends would have bought My Blood Approves (retailing at £0.72 on Amazon). The crisis that’s looming is that while the price of e-books is pushed to almost zero by the rush of frantic amateur self-publishing activity, the established publishing businesses will be forced into life-saving cost-cutting. Again, this is something from which those who have an interest in maximizing internet traffic and selling e-readers and internet advertising will benefit. For a while, all those new Kindle owners will find it liberating to see the prices of all e-books fall, allowing them to vastly expand their libraries, while at the same time, paradoxically, they will wait anxiously for someone to buy their own literary e-offerings online. Already the stars of self-epublishing are leaving the system that launched them. Hocking signed a deal with Macmillan that gave her a $500,000 advance on four separate books in a series – a total reversal from the way self publishing is done (with zero advances being paid and all work being done on “spec”). The self-epublished author has left the glass-ceiling world of .79 cents e-book sales (to embrace the old mainstream model, believing that it is the only system that can elevate her to a higher profile and bring her into an arena where her books can by “synergised” with tie-in products such as films, TV serials, even toys) and the door of opportunity closes behind her as she exits, leaving hundreds of thousands of self-epublishing authors without a model to aspire to. Meanwhile the mainstream publishing houses have suffered huge losses and now can only publish authors who seem to offer a guaranteed return. The entire field of publishing has shrunk, beneath what seemed on the surface like an infinite expansion. Publishers have been forced to launch their own e-publishing sites in the attempt to join in the bubble and gain kudos, but they are too late and are wasting resources, and further undermine their old status as market leaders. They in fact turn to the new model of the self-epublishing “star” to get them out of the doldrums. This is the point at which self-epublishing becomes a hall of mirrors and speculation runs in circles. And what has happened to all those new authors who were told they could make money from e-publishing? Well, they are working entirely for free (on spec) on the promise of those big 70% royalties on future sales. They write their books, they blog, they net-network and self-promote; they could put in as much as a year’s work, all without payment. So much writing-for-free is going on that it upsets the previous paradigm: people start to ask, why should any writers get paid at all? Why should “professional” writers get a wage or advance, when I’ve had to do all this work on my self-published e-book for free? And then comes the collapse – if you work for free and have to slash your costs to be competitive – to, say, undercut the vast 99p market by going down to 45p or 15p – then your chances of ever seeing a return on all the free labour you’ve put in diminish accordingly. Add to this the fact that hundreds of thousands of others are competing with you in this pricing race to the bottom and the possibility of any newcomers making any money from self-epublishing vanishes. The bubble bursts. Panic starts and euphoria is replaced with revulsion. Outsiders start to sell, but there are no buyers. Panic sets in, prices start to tumble downwards, credit dries up, and losses start to accumulate. The market is forced back to pre-bubble levels, with major destruction to its infrastructure. The “Lender of the Last Resort” may step in to save what is left. 1. After a long year of trying to sell self-epublished books, attempting to self-promote on all available networking sites, and realising that they have been in competition with hundreds of thousands of newcomers just like them, the vast majority of the newly self-epublished authors discover that they have sold less than 100 books each. They then discover that this was in fact the business model of Amazon and other e-pub platforms in the first place: a model called “the long tail”. With five million new self-publishing authors selling 100 books each, Amazon has shifted 500m units. While each author – since they had to cut costs to 99p – has made only £99 after a year’s work. Disillusionment sets in as they realise that they were sold an idea of success which could, by definition, not possibly be extended to all who were willing to take part. The now ex-self-epublished authors decide not to publish again (it was a strain anyway, and it was made harder by the fact that they weren’t paid for their work and had to work after hours while doing another job – and they realised that self-promoting online would have to be a full-time job.) They come to see self-epublishing as a kind of Ponzi scheme – one created by digital companies to prey on the desires of an expanding mass of consumers who also wanted to be believe they could be “creative”. They also become disillusioned with their e-readers, which are now out of date anyway. And so they return to the mainstream publishers to look for culture. Unfortunately, as a result of the e-book market implosion it is impossible for publishers to push their prices back up to pre-bubble levels (from 99p to £12.99), and so their infrastructure continues to decline. And since they have decided to look for new talent in self-epublishing, they are trapped in the very same bubble that everyone else is trying to get out of. 2. The “Lender in the Last Resort” cannot really step in to save the “investors”, as these are the hundreds of thousands of hopeful and now-disappointed first-time e-publishers. Instead, the government (if we’re lucky) steps in to bail out the publishing industry, and to regulate the digital companies that created the bubble in the first place. Or the government could continue to subsidise these companies, as it does just now, and in so doing create the next bubble. Fascinating stuff. One bit that strikes me as off the mark, though, is suggesting that Hocking’s exit means that there is no model to aspire to. Seems to me that the model remains, one that predates e-publishing: Look for something that achieves mainstream breakout success and copy it. Publishers are looking for stuff that sells, stuff that’s “kind of like X.” So now they’ve added trolling through e-published books and related posts, articles, etc. to spot possible material.